Norwich prospered in the 16th century, thanks to an influx of immigrants, who arrived fleeing persecution. ‘More than a third of the city’s population now immigrants.’ Today that reads like a shock tabloid headline, but 450 years ago in Norwich, refugees were welcomed. To outsiders, this was astonishing. The contemporary writer and historian Alexander Neville noted that Norwich was ‘a city seated daintily, most fair built she is knowne, pleasing and kind to Strangers all, Delightful to her own’. The poet Michael Drayton described Norwich as ‘That hospitable place to the industrious Dutch’. Norwich was economically depressed when, on 1 June 1566, the Mayor and Corporation formally invited 30 named incomers, 24 Dutch and six Walloons, to help revitalise its cloth industry. Each could bring up to ten people with him. Many more Protestants subsequently came from the Spanish Netherlands and later from France, fleeing persecution by Roman Catholic authorities. Often referred to as ‘Strangers’, they formed two communities in the city, according to language – Dutch or French speakers, the latter generally known as Walloons. These migrants spoke different languages from the native population, they worshipped differently and had a different culture. At first they lived in tight-knit migrant communities, clustering in specific parts of the city. Each community needed a church. The Dutch speakers were assigned the chancel of the former Blackfriars monastery, the French permitted to worship in the chapel in the bishop’s palace. 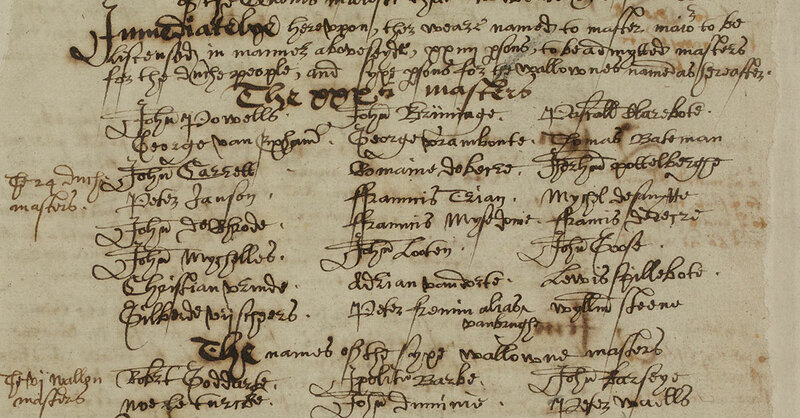 A census conducted in May 1568 identified over 1,800 incomers. The majority was connected with the weaving trade, including weavers, merchants and dyers. Others included potters and gardeners and one of the first people to print books in Norwich. The records they left, such as wills and inventories, church records and letters home, paint a vivid picture of their lives. Clais van Wervekin, a hat-maker from Ypres, wrote to his family: ‘When you come, bring with you, if possible, a dough trough, for you don’t find any here; they knead everything in earthenware which is most disgusting.’ But he also commented, ‘You’d never believe how friendly the people are here.’ The wife of Jaques Rollier wrote to a friend that she was living in a good ‘passage’, where many people walked by, close to the market and church. Prudens de Rijcke, a servant, listed everything she owned in her will. She left Jane Puyell ‘my best hat, one linen apron, two neckerchers and two kerchers’. Her kinswoman in Leiden, Prudens van Morchassche, was to have ‘one tanye petticoat, one purple coat and one frisado [linen] petticoat’ – unless she proved to ‘walk inordinately’ (how good it would be to know what that meant), when another woman was to have the best of these petticoats. The city kept close track of migrant numbers. In 1583 the total of 4,679 was an increase of 754 over the last count 12 years earlier, but over 2,000 of the refugees had died of plague in 1579. At its peak before the plague, the immigrant population must have been between 5,000 and 6,000. It is harder to calculate the native population of the city, as no census was ever taken, but the historian John Pound calculated from tax returns that it was about 12,000. Inevitably not all the locals were happy about the migration. Matters came to a head in 1570. On 16 May, John Appleyard and other country gentry announced that they would beat the Strangers out of Norwich. They tried again several times over the next few months, but few joined them. On 24 June, the malcontents assembled in Harleston to march on Norwich, but were rounded up before they entered the city. There is only one case in the courts between the 1560s and the end of the century of what seems an attack motivated by the victim’s outsider status: a local man was accused of assaulting two Dutchmen. One Norwich man wrote to the Privy Council claiming the incomers were breaking trade regulations, but the city authorities said this was untrue. However, most local people agreed with Elizabeth I, when she wrote to the city on 19 March 1570/1. She reminded the citizens of Norwich of the advantages they had derived from so many skilled workers who inhabited houses which previously had been left empty and who provided work for the many who would otherwise have been unemployed. The children of these marriages included Samuel and Anne Dryebread, baptised at St Michael at Plea in 1590 and 1592, and Ayla and Abraham Scot, baptised in All Saints church in 1599 and 1600. These children are among the earliest examples of that merging of the incomer community with the native-born community, which became increasingly common as the next generation grew up. It is often said to have given Norwich people their unique character – and it brought them the canary, brought by the Strangers for breeding, which is the symbol today of the city and its football club. Frank Meeres is the author of The Welcome Stranger (Lasse Press, 2018). Proceeds from the book are being donated to the Norfolk Archives and Heritage Development Foundation.